Heading to the far Arctic North and wondering how many layers of clothes you’ll have to take with you? Or what the weather will be like? I mean, there’s sure to be snow… right? I can’t help but think I’m cursed sometimes, because wherever I go, I stop the snow. I lived in England for over two years, I’ve travelled extensively in Europe in the winter, including visiting Iceland and Norway in the colder months. Tokyo was where I saw the New Year in in 2012 and I’ve bloody well been to the Arctic Circle and I still haven’t seen snow. Proper snow, like in the movies, where you can build snowmen (snowpeople?) and make snow angels and have snow ball fights and I’ve been denied this for the entirety of my life and it makes me sad. Anyway. 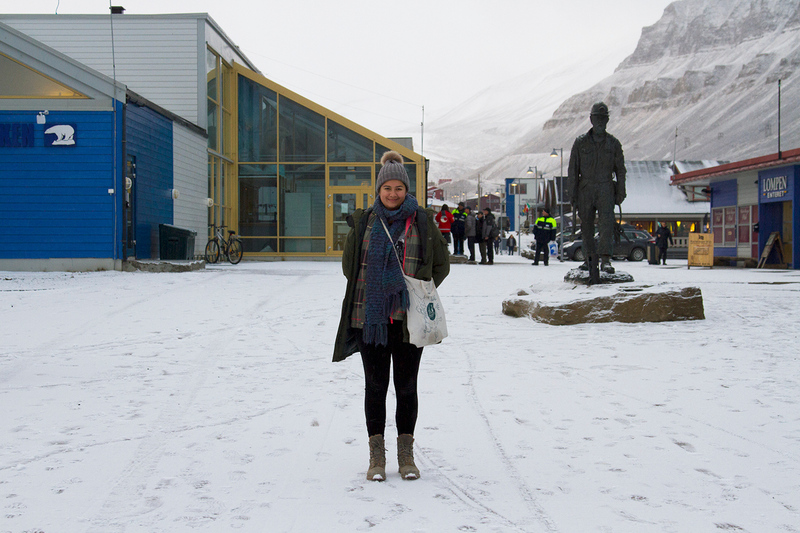 Snow, or no snow, it’s cold in Svalbard. I ended up borrowing a lot of clothes to see me through my few days there. As I was about to move back to Australia, I didn’t see the point in investing in a proper winter coat, particularly not when a friend was happy and willing to lend one to me. 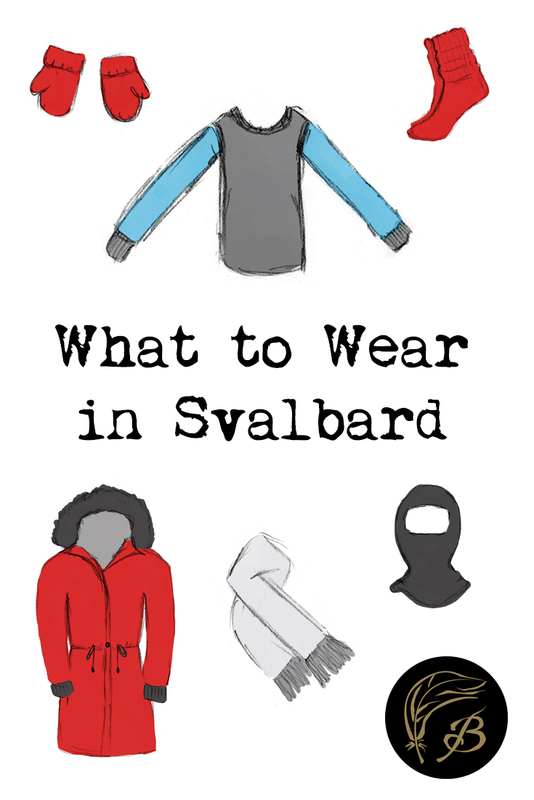 Here’s what I recommend packing clothing-wise for a trip to Svalbard. 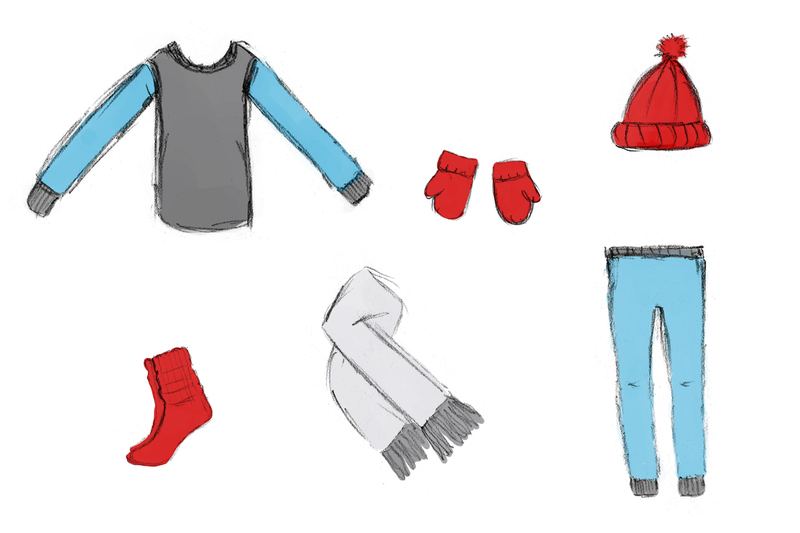 If you don’t have these items in your wardrobe, I thoroughly recommend borrowing what you can and purchasing only what you think you’ll end up using multiple times over. And if you’re wondering what you can get up to during your time in the Arctic North, here are some of the best things to do in Svalbard. You’re standing in your undies/pants, trying to figure out what the hell you’ll need to put on to stay dry and cool. Well, first things first – you’ve got to get yourself a suitable base layer. I love thermal underwear. I wear it in winter destinations obviously, for pjs in the wintertime at home and around the house as oh so fashionable “loungewear”. My go to fabric is merino wool. It’s quick-dry and extremely warm, plus it doesn’t retain body odour. This means you can wear a pair for a couple of days in a row, without offending people with your rank stench. Polyester is said to be a good fabric for similar reasons, on the cheaper end of the scale (avoid cotton – it doesn’t dry quickly). As I fancy myself to be a green traveller, I avoid buying polyester clothes these days. Merino wool all the way, baby. I then ignored my own advice about quick-dry fabrics and threw a t-shirt and velvet leggings over my thermals each day. Remember the days of the “emo”, when long shirts under tees were a fashion statement? Sometimes I really miss 2003. I wasn’t an emo – I swear. Thermals probably won’t be enough, so the next step is a nice fleece jacket and perhaps trousers. You’re going to be a bit of an “insert-animal-of-choice-here in sheep’s clothing” – but those animals do tend to thrive in the most harrowing conditions, so they must be on to something! Once again, polyester can be used in lieu of fleece. I usually retch when looking at fleece jackets in shop, but you’ll find a fashionable one if you look hard enough. Fleece tracksuit pants or leggings wouldn’t go astray either – but I wore two pairs of thermals instead. 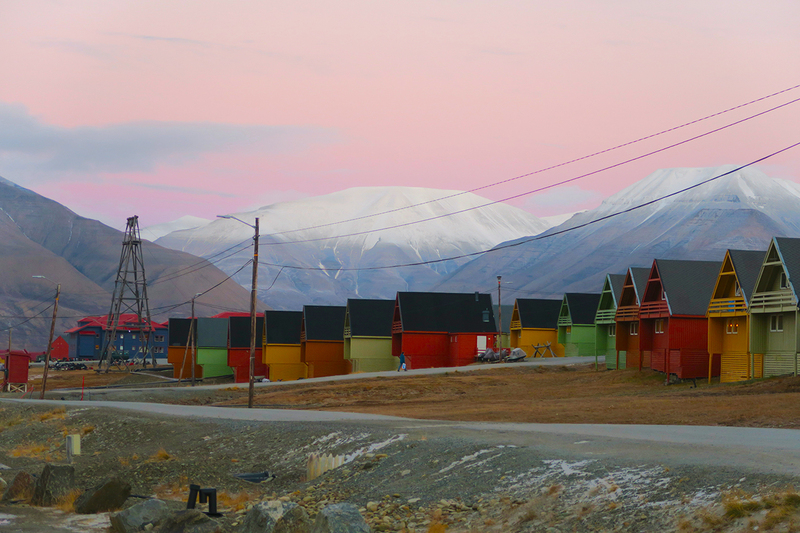 Expect three hour sunsets, if you travel to Svalbard in the shoulder seasons. Perhaps the one regret of my trip was not bringing along a pair of waterproof trousers – mainly because it rained in Svalbard, which is an arctic desert, although let’s not get into all of that right now (*cough* climate change *cough*). I managed to get through my trip with just thermals and leggings, although if I had my time again, I’d probably bring along the waterproof trousers. No harm in being prepared. Please note – if you do end up doing any tours in Longyearbyen (dog sledding, ATV adventures, etc), the companies will supply you with protective gear. So, you don’t need to worry too much about how your clothing will fare against the elements in extreme settings. This is more about getting from point A to B without losing your fingers, nose or toes. When I’m feeling even the slightest bit cold, all I need to do is slip on a pair of socks and I’m ready to rumble. Once again, I’m going to nominate merino wool socks as being the best for the job. Although, I used a pair of bed socks that I think I bought from Target of all places eons ago and they were fine. Depends on the weather and the quality of your shoes too. Staying warm whilst adventuring outside of Longyearbyen. My leather gloves weren’t going to hack it in the Arctic Circle. So, I borrowed a friend’s ski gloves, which are warm, but cumbersome to use. I was forever having to take them off to use my camera (don’t judge – Svalbard is extremely photogenic). Arctic mittens would be a good bet, worn over thin fleece gloves that don’t restrict your movement. I am going to have to report back on the best hard warmers when I’m next in a winter destination, but one of my best friends (who lives in Switzerland and therefore knows her stuff) swears by them. I’ve seen tiny little hot water bottles that can be slipped into coat pockets and reusable hand warmers, too. I’ll be investigating this further the next time I’m in Europe, so the jury’s still out on which product will serve best. Just something worth considering. I travel the world with a thick woollen scarf that my Aunty knitted for me years ago and it does a pretty darn good job of keeping me warm. It’s long enough so that I can wrap it around my chin and nose if need be. I love scarves – they’re practical and they look good too. However, wind can get everywhere, sometimes in the nooks and crannies that a scarf may not accurately cover. In this instance, I’d recommend a balaclava. Get one with a hole for your face. You can pull it over your nose, or down past your chin. You also won’t look so much like a bank robber, which is a good thing. Gotta keep that noggin’ warm. I have two woollen beanies and a head warmer, which I rotate. I particularly like the head-warmer, mostly because I bought it in Iceland and it’s pretty. Don’t worry too much about your headwear being waterproof – get a coat with a hood and you’ll be right. My trusty (and muddy) Timberlands. As far as shoes go, I made do with my insulated Timberlands, which have seen me through several winters. Paired with thick socks, they did the job. If I were to spend more time in Arctic conditions, I’d probably get a pair of moon boots with a thick sole – I like the way they look! 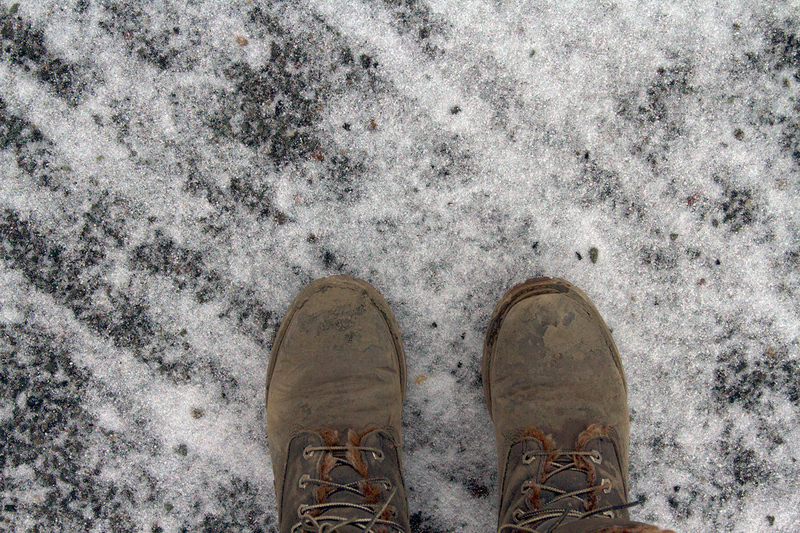 If I were to be a far more sensible person, proper arctic boots would be in order. For a short trip, I don’t see an issue with a solid pair of waterproof boots. Unless it’s the dead of winter, of course. Here’s an investment I’m yet to make. I got through two decidedly mild English winters with a pretty basic coat, which I knew wouldn’t be able to stand the Arctic temperatures. I borrowed a coat off my friend and it did the job. One day I will buy a proper, quilted winter coat, with a hood lined with faux-fur (simply because it looks pretty), which is big enough to contain my layers. Bonus points if it’s bright red. Shoes stacked up at the university. 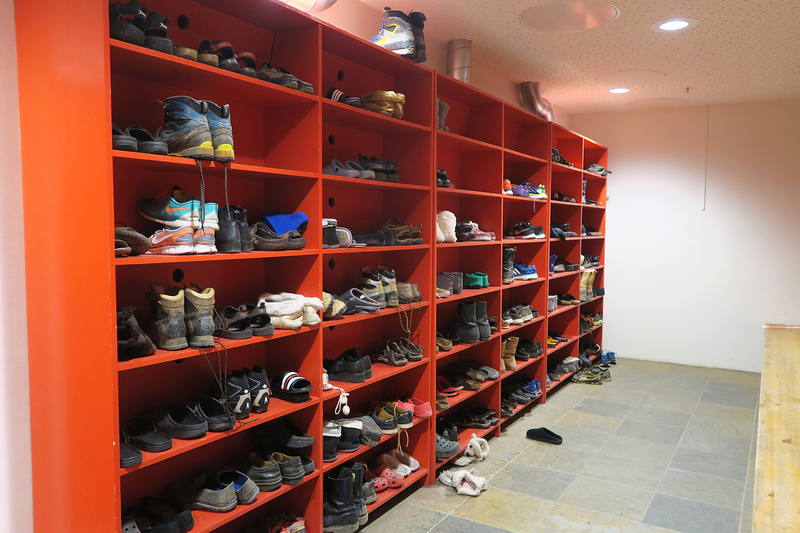 There’s a saying in Longyearbyen, Svalbard’s capital, which goes “Leave your boots and gun at the door.” Not to be taken literally per sae, but it is considered good mannered at many establishments, to remove your boots before entering. Some places – such as local hotels – will provide you with slippers, that you can pop on your feet. Others don’t, so you’ll be plodding around in your socks. You could bring some thin slippers to pop into your bag and whack them on your feet, to save your socks from getting too grubby. So, that’s it! Please keep in mind, that this list is intended for those travelling to the region for a short period of time. If I were going to Svalbard or anywhere like it for a good stretch, I’d consider investing in good quality items, to keep me warm. As it were, I managed to borrow much of what I needed from friends. Saved me bucketloads of cash, which was nice. Hooray! Have you been to Svalbard, or anywhere else like it? What would you recommend adding to this list? Planning a trip up north? Please pin this post for future reference! As I sit here in the rain in Slovenia giving up my hopes of sledding and snowshoeing, I feel your lack-of-snow-pain! Fortunately, I have had tons of snow time. I have a bunch of friends who have made it to Svalbard (I work for a Polar Bears International), but I have yet to make it there. I think you did a great job choosing your layers and love that you borrowed rather than bought since you don’t need that all the time — a very eco-responsible choice! You poor thing! That sounds like a mega cool job. My big regret was not seeing a polar bear, although I didn’t really expect to. Thank you, although I think I might indulge in another pair of merino thermals before heading anywhere cold again. They’re so multi-purposeful! I’m impressed you made it up to Svalbard! It’s unlucky you’ve not seem snow before this, I’ve just been in Vienna and had over a foot of snow and I wasn’t even searching for it! I agree with your choice of clothing, especially the Merino wool, anything with Merino wool keeps you warm when it’s cold and when it’s warmer it’s not to hot. I have very bad luck! Merino wool is the shiz niz. I have never been anywhere with “real” snow either! I think before I do I might just need to buy a new wardrobe! ? Haha yes, they would certainly warm you from the inside, out! Brrrrr… i’m freezing just reading the post. I love the winter and have seen plenty of snowfall in my life but haven’t been to the really cold regions where the temperatures are well below minus. Thanks for the guide, although I was doing mental math and buying all these clothes for a trip up north would prove to be very expensive I think. But, for travel we must. Yeah it would be ridiculously exy. I borrowed almost everything I needed off friends and thoroughly recommend doing the same. I’ve been reading a lot of travel blogs lately and I’m amazed at some of the destinations that people have been to – Svalbard, for you – excellent, and I’m amazed, yet again. 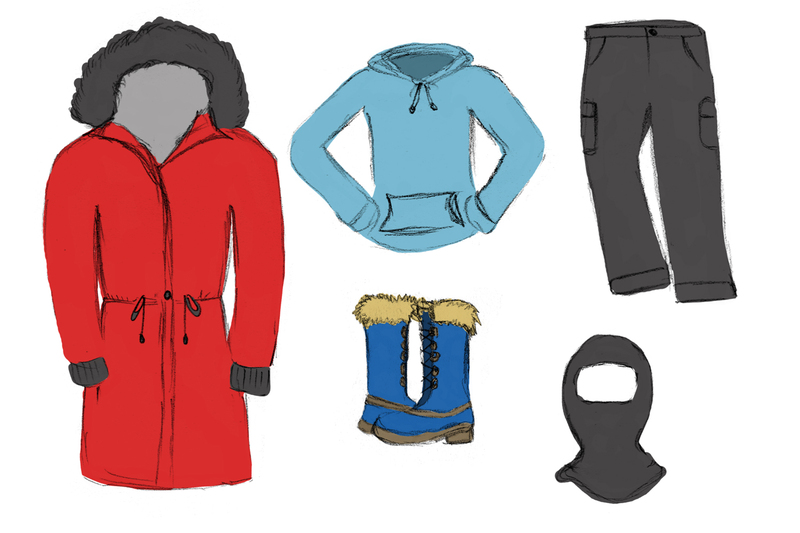 Your post on the correct clothes to wear in Svalbard was interesting and very informative. I’m a keen trekker – going to Nepal this year, and I’m also a big fan of merino wool clothing. Too bad you haven’t ever seen proper snow, I’m from Scotland, and although we don’t get as much snow as we did in the past, it still snows here every year. Nice post. Thanks for sharing and good luck on your travels. Ps I’ll try and remember my slippers if I ever make it to Svalbard! Your comment about not getting as much snow in the past frightens me. In a similar vein, we’ve had one of the hottest summers I can remember in Australia. The world is changing. Thanks for the great guide and tips. I’m going to have to do a lot of shopping before I visit Svalbard because I live in a warm country. I can’t believe you’ve been to all those countries and haven’t seen proper snow yet though! See and this is exactly why I have spent most of my adult life avoiding snow lol. I agree it does look romantic in the movies but the reality is miserable for the most part. I live in Sydney where thankfully it never snows but about 6 hours drive away we have our snow fields and we used to go every year. The amount of layers I piled on was ludicrous! I’ve lived in Sydney for half my life, which is probably part of the reason why I’ve never seen it properly! Just ONCE would be nice and then I’ll be happy. When I live in a cold climate again I’m going to look into reusable hand warmers. I definitely remember seeing mini water bottle types in Europe somewhere. Haha yeah, the UK climate is so delightfully mild, which frustrated me a bit when I lived there! Just wanted snow! Thanks for this, It;s very useful. So glad to hear that, Elif! Hope you have a wonderful trip.